The Blue-throated Hummingbird (Lampornis clemenciae) - also known as Blue-throated Mountaingem or Blue-throated Sylph - is a large hummingbird that is named for the iridescent blue throat patch (gorget) of the adult male. The Blue-throated Hummingbirds winter in the mountain woodlands of Mexico, following the highlands and central plateau as far south as Oaxaca. For the breeding season, they will migrate to the mountain canyons of southwestern United States, including southern Arizona, southern New Mexico and western Texas. Vagrants have been recorded in California, Colorado, northeastern New Mexico, Eastern Texas, Louisiana, Alabama, South Carolina, Georgia and Florida. The Blue-throated Hummingbirds are usually found close to water. They prefer pine-oak forests, but also occur in open areas. - Found in southern USA (southwestern Texas) and northeastern, central and southern Mexico (Sierra Madre Oriental and central plateau south to Oaxaca). - Found in southwestern United States (southeastern Arizona, southern New Mexico) to northwestern Mexico (eastern Sonora and western Chihuahua). The Blue-throated Hummingbird is a fairly large hummingbird, measuring 11.5 to 13.5 cm (4.5 to 5.25 inches) in length and weighing between 6 to 10 grams. Their wingspan is typically 79 mm (3.1 inches) for males and 68.5 mm (2.3 inches) for females (Johnsgard, 1983; Howell, 2002). Common Physical Traits: The upper plumage is dull green, fading to a medium grey on the underside. It has white stripes behind the eyes and a narrower stripe extending backward from the corner of its relatively short bill, next to a blackish cheek patch. The tail feathers are iridescent bluish-black with broad white tail with white tips on the outer most tail feathers. 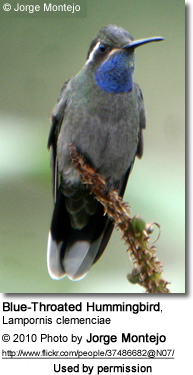 The male has an iridescent blue throat patch (gorget), which may appear black or grey color in poor light. The female's throat is grey. Otherwise males and females look quite similar. 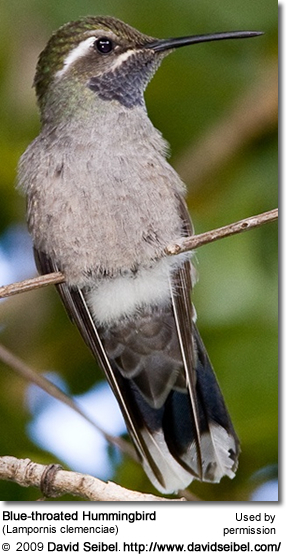 Juvenile birds look like females, except for a buffy edging on most feathers, especially on crown and rump (lower back). 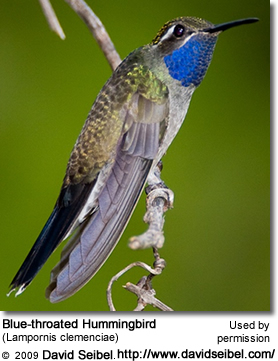 Similar species: The female Blue-throated Hummingbird resembles the Magnificent Hummingbird, but has much larger white margins on her tail feathers. 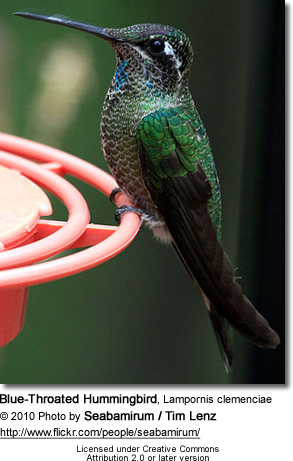 The Blue-throated Hummingbird is most easily differentiated from other species by their two white facial stripes. Flight: Even though Blue-throated Hummingbirds are rapid fliers; they have the slowest wing beats of any North American hummingbird species. There are visual and audible differences between the Blue-throated Hummingbird and the considerably faster wing beats made by the Magnificent Hummingbird. Lifespan: Little is known about the average lifespan; however, the longest-living male has been recorded living for 12 years (Johnsgard, 1983). The male's only involvement in the re productive process is the actual mating with the female. He will separate from the female immediately after copulation and move to higher elevations. He does not participate in choosing the nest location, building the nest or raising the chicks. The female Blue-throated Hummingbird is responsible for building the large cup-shaped nest out of green moss fastened to a vertical plant stalk. She lines the nest with soft plant fibers, animal hair and feather down, and strengthens the structure with spider webbing and other sticky material, giving it an elastic quality to allow it to stretch to double its size as the chicks grow and need more room. Unlike other North American hummingbirds that typically place their nests in bushes or on horizontal branches, the Blue-throated Hummingbird female usually places the nest in a covered area, such as a rock canyon wall, rock overhangs or under a human structures, for example under roofs, sheltered cabins or woven into a wall. They tend to nest close to, or over running, water. The Blue-throated Hummingbird usually returns to the same nesting site year after year; building her new nest on top of the previous nest(s), which eventually take on the shape of a "nest tower." For example, one female built her new nests on top of her old nests for 10 recorded years. On that tenth year, this nest was 127 mm (5 inches) high and 63 mm (2.5 inches) wide. It is estimated that she used around 24,000 kilometers (~14,913 miles) of spider and insect thread during the construction of these nests. The average clutch consists of two white eggs, which she incubates alone for about 17 to 19 days. The young are born blind, immobile and without any down. As is the case with other hummingbird species, the chicks are brooded only the first week or two, and left alone even on cooler nights after about 12 days - probably due to the small nest size. The chicks leave the nest when they are about 24 - 26 days old. Under ideal conditions, she may raise up to three broods per year. In general, they favor flowers with the highest sugar content (often red-colored and tubular-shaped) and seek out, and aggressively protect, those areas containing flowers with high energy nectar. They use their long, extendible, straw-like tongues to retrieve the nectar while hovering with their tails cocked upward as they are licking at the nectar up to 13 times per second. Sometimes they may be seen hanging on the flower while feeding. The Blue-throated Hummingbird eats more insects than other hummingbird species, allowing them to do well in areas where the more nectar dependent species could not survive. For example, they will feed on any insects that are attached to plants, as well as small spiders, small beetles, flies, wasps and plant lice). All of which are important sources of protein particularly needed during the breeding season to ensure the proper development of their young. Insects are often caught in flight (hawking); snatched off leaves or branches, or are taken from spider webs. A nesting female can capture up to 2,000 insects a day. Even though the Blue-throated hummingbirds are not easy seen, this species is known to be quite vocal. The male's song is described as a loud seep (somewhat like a squeaky wheel) - often repeated several times. This call is uttered in flight or when perching. He also produces a quiet yet complex whispered song. Females are also reported to sing during the breeding season mainly to attract males.